What a month September proves to be. My lowest rental income month. I am so not thrilled but I try to keep my rental property in as comfortable a state as I love my own home to be. My adorable tenant is my very young brother in law in his first job. He shares the 3 bedroom duplex with his two room mates. Its a great feeling to know he is there to see to it that his brother's investment is taken care of. Knowing that he will do just that, I reduced the rental and will not be taking it up anytime soon. I know and wish he buys his own place as soon as he can. That will sure hurt but he has to grow up and invest in an asset too. I also had a chat with him a few months ago about demanding stuff to be done to make the place comfortable and not letting things slide because he lives in his brother's place. Indeed he took the chat to heart and in the process had me a great property and an empty bank account...Love you still lil' brother. 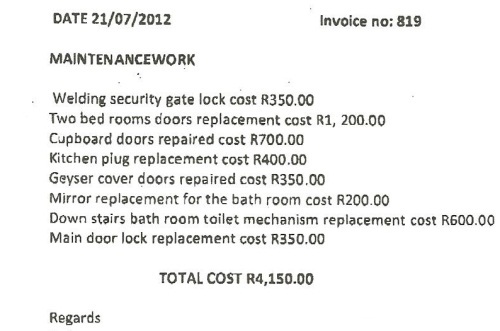 That's the invoice I got from my property manager, not from the service provider. As you probably know that I choose to have a property manager and I like it that way. See how its dated July and the work done this month. Handymen and builders' style. But he seems to be doing a great job for my manager. He fixes and replaces stuff in all the properties he manages. I just learned that changing door locks in between tenants is critical. With all the crime, we want to protect our tenants as much as we can. Another cost to avoid by having low tenancy turnover, if you are a landlord. So we had the security gate welded and repaired for R350. There are electricity costs hidden somewhere there. I don't even know how much electricity that takes. I am very happy with the lock replacement. One of the realities of investing in property in South Africa is the high costs of residential property security. Two of the three bedrooms now have brand new doors. This is the very first time that I replace doors. I really never buy vandalised properties. I was in a bit of a shock to see that I need to replace the doors. Even the closet doors and the cute geyser cupboard door. What were the former tenants doing with the doors in this house? I so get why people don't do residential rental property. There it is my friends. My life is more interesting and costly this month compared to August. But I'm more than glad to be alive. I will just have to spend less, if that is even possible with so much craziness of this month. We just came back from a holiday, which proved to be way too expensive than I expected. My brother has some graduation craze going on, and that means COSTS AND MORE COSTS. Come month end to view how I managed to survive the expensive month with the lowest rental income this year. 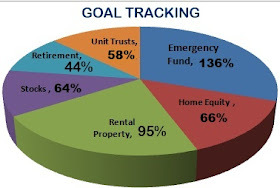 This is the reason most people do this property investment business part time. A salary always gives great security. Ag, no need crying, I know I will live, I always do. I would love to hear from other landlords. How do you survive high repair costs and the high cost of security in our country?